Our daughter Gina Inhelder Pito was in an almost fatal car accident on March 27, 2002. She sustained an incomplete spinal cord injury at T10-11, the middle portion of her spine. Gina is now in a wheelchair as a paraplegic with no use of her legs. After her accident, she spent the next 4 1/2 months in 3 different hospitals followed by a year of outpatient therapy. Since then, she has had 3 pressure sore surgeries, each requiring a 6-week hospital stay and lengthy periods of being bedridden at home to complete the healing process. Gina’s accident was life-changing for all of us! On May 31, 2015, we were driving behind Gina and her family to a local restaurant after church. We witnessed a car suddenly jet out from a parking lot to beat the oncoming cars. This car struck and rolled their car over three times. Miraculously, no one was seriously hurt! However, Gina’s car with special hand controls was completely totaled. Now Gina and her 2 ½-year-old daughter Madison are housebound as Matahi, her husband of five years, works hard to provide for his family. On my two days off each week, I help them with errands and take them on family outings such as mommy and me classes. As much as we enjoy our special time together, Gina would like nothing more than to regain her independence. Ever since Gina was a child, she has been a giver by nature and she misses being able to help and be connected to others. I am writing this letter to request your consideration of a charitable contribution to help Gina and her family with the purchase of a modified vehicle. 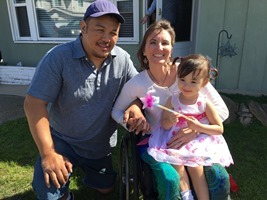 Though she had car insurance on her SUV at the time of her accident, it was not enough to cover the expense of obtaining an affordable, modified wheelchair accessible van, estimated at $45,000. This presents a challenge that we cannot meet alone. To help offset this financial burden, a fundraising campaign in Gina’s honor has been established with Help Hope Live, a trusted nonprofit organization that has been providing community-based fundraising guidance to patients and their families for more than 30 years. All donations are tax-deductible to the full extent allowed by law, are held by Help Hope Live in the Southwest Spinal Cord Injury Fund, and are administered by Help Hope Live for injury-related expenses only. Gina’s positive outlook is remarkable especially when you consider what she has gone through. She and Matahi are focused on their many blessings: a loving marriage, living in their own one-bedroom apartment, and raising their beautiful daughter. Now, to be able to give back to all those who have been there for her and her family, and to be an active participant of society would make Gina’s life complete. Thank you in advance for your kind consideration and your prayers. Each and every donation will make a difference. So her it is 3am as I write this with our 3year tenderly resting her head on my stomach as she sleeps and my husband is soundly asleep and exhausted on our sofa after collapsing and falling asleep from working two 18 hour shifts in a row and so so many extra hours of work this week. And I share this because I was advise to let others know your daily struggle in not having transportation as a mom. There will be so many fun events happening especially this week- which will include a parent Valentine breakfast, getting our kids there way early on Wednesday for a field trip & next week is patent & teacher conferences- which I too want to be there for!- it’s our very 1st parent teacher conference!!!! I comfort myself saying, what she doesn’t know, she won’t miss. Now I can feel and have more compassion what other parents struggle with especially single parents- thankfully I am happily married who my loving husband is a very hard worker who works hard so I can be home with her and for her go to preschool part time for peer social interaction. Yet with no public bus stop near us nor accessible transportation for me to use its hard on us all for me not to be able to help out and share in the load. What makes it difficult is I live by the motto, Complain privately, Praise publicly. I don’t want to give you the wrong impression here- I am not complaining- I have faith God is at work here- yet I am sharing my struggle to please pray for us. Yet we are so so appreciative to family who help us with all this! We are never meant to struggle alone! We all need others! So we thank you all of you. Please know, I am Not asking for anything but prayer! Yet please help me help you – especially for our daughter Madison too..
May God bless you more than the ways you share your love to us! I am trying to raise money to get an accessible mini van so I can drive quickly and easily with especially Madison and I and my husband. This way I along with Madison and others can not only do errands for ourselves but more importantly so I can come see all of you who have so graciously have helped us. I am trying to raise $45,000. Anyway you can help it’s so appreciated!!! If you like one more last chance for a 2016 tax write off here is one. Still plugging away for you Gina! This donation is from my mom, Ardie Sarris, and a bit from a coin donation jar I put out for you. Hugs and love and happy Thanksgiving!! Another fundraiser donation for you Gina! Little by little, we will get you that van! Hi, Gina! My donation is the contribution of so many who gave generously from their hearts. Know that you are being covered in prayer as well!! I will be continuing my fundraisers for you until your goal is met for your van! Love you sweet sister!!! Spreading the word and sending the prayers. Gina I pray you will receive the funds you need. I'm sharing this on my FB in hopes others will donate.